7 Bedroom Detached House For Sale in Surrey for Guide Price £2,250,000. 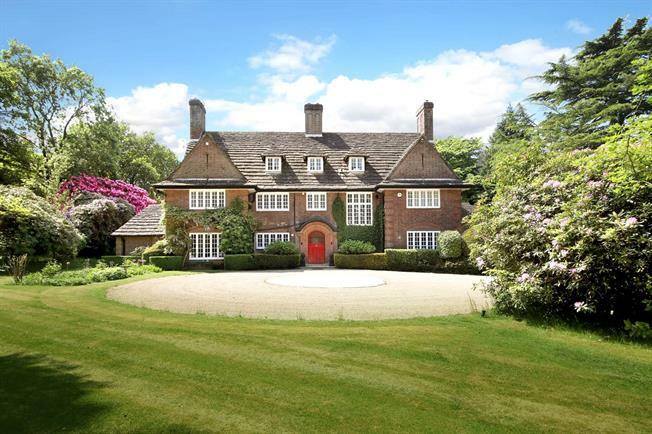 Coneybury is an imposing and handsome, detached country house of quality which was built in 1912 to the exacting design of Sir Banister Fletcher. Using Horsham stone for the roof, the exteriors elevations are of red brick with large, multi-paned windows and a distinctive brick arch over the front door. Internally period detailing such as the stone fireplace in the drawing room and the original parquet flooring, have been skilfully enhanced by the present owners during a recent comprehensive programme of refurbishment and up-dating and it now provides everything required for a modern and comfortable lifestyle. Accommodation is laid out over three floors and includes gracious reception areas and a kitchen/breakfast room furnished with contemporary styled, high gloss cabinets and black granite work surfaces, serviced by a fine pantry and wine room. In total there are seven bedrooms arranged over the upper levels. The principal suite spaciously provides a fully fitted dressing room with walk-in wardrobe as well as an en-suite bathroom, whilst the second floor also has a charming reading area and a tv/games console room. and Banstead Heath at the end of the road with miles of paths through beautiful countryside, ideal for dog walkers and runners. The area also has some very well regarded state and independent schools including Aberdour, Chinthurst, Dunottar, Micklefield, Reigate Grammar, St. John’s Leatherhead and Epsom College. Approached via a pair of electric gates on to a sweeping gravel drive, the gardens surround the house and are landscaped to provide year round colour as well as seclusion. Tall, majestic trees and mature mixed hedging are intermingled with banks of rhododendrons, herbaceous borders are well stocked with a variety of spring flowering bulbs and roses, whilst elsewhere is a fish pond. Immediately adjoining the rear of the house is a wide sun terrace that overlooks the extensive lawns and leads to the swimming pool, which is set to one side and benefits from tall, glass screen. A castellated tree house is constructed within the trees and a barbeque is contained within a brick built outbuilding. Tucked away at bottom of the garden, almost out of sight there is also a hard tennis court.